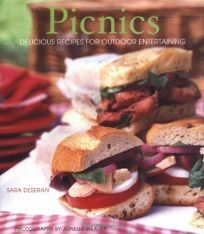 Cheerful and appealingly sized (just small enough that it could actually be taken on a picnic), this book by Deseran (Asian Vegetables) contains more than 45 recipes for picnic fare that go far beyond the standard sandwiches and potato salad. Not that there aren't recipes for potato salad: there's German-Style with Bacon and Mustard and Cajun. As for sandwiches, Roasted Pork with Fennel and Apple and Pan Bagnat with Tuna, Tomatoes and Olives will excite discriminating palates. Easy elegant entree offerings include Cold Slow-Roasted Salmon with Cucumber-Cumin Raita, and Grilled Shrimp, Zucchini and Tomato Skewers. Desserts such as Toasted Almond Bundt Cake with Raspberries and snazzy drinks like Mojitos and White Wine Sangria with Cherries provide a sweet touch. Color photographs by Jonelle Weaver make dishes like the Nectarine Tart jump off the page.